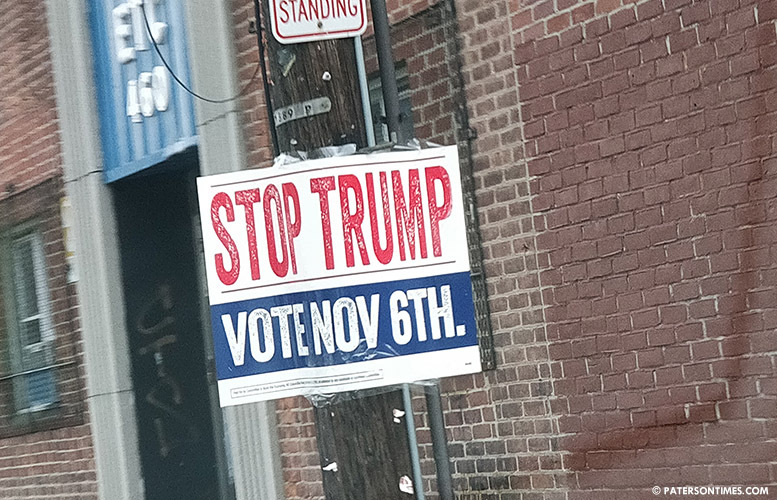 The large number of anti-Trump signs plastered throughout Paterson in violation of municipal ordinance will be taken down, said mayor Andre Sayegh on Monday morning. “I don’t disagree with the message,” said Sayegh. The message, “Stop Trump. Vote Nov 6th.” He said he disagreed with the “method,” where the posters have been installed. The Committee to Build the Economy placed the posters on traffic and utility polls throughout the city, including downtown Paterson. Sayegh’s political ally Ed Farmer is behind the Committee to Build the Economy. He held a $1,000 per plate fundraiser for Sayegh during the mayoral election. He also worked on Sayegh’s campaign. Farmer also founded the super PAC that savaged Sayegh’s opponents during the mayoral race. He is also a trustee of the mayor’s One Paterson Foundation. “I’m going to speak to our DPW director this morning,” said the mayor. Public works has the authority to remove the signs and issue summonses to the violator. Sayegh criticized his opponent two years ago for placing campaign signs on traffic poles in violation of municipal ordinance. “No campaign material or political sign shall be attached to or affixed upon any public place, public facility or on public property by any means,” reads municipal ordinance 04-009. Some residents took to social media over the weekend to express their anger. Many argued the signs make the city look untidy. Others pointed out the signs violate local laws. Thomas took down two dozen posters on Monday afternoon. He said the city should mail tickets to the address listed on the poster. Residents are not fans of the president. Many, like the mayor, who described Trump as the “orange one” during his inauguration, dislike the president and his policies. For example, hundreds of residents protested Trump’s so-called Muslim ban. Paterson overwhelmingly voted for Hillary Clinton in the 2016 presidential election. Sayegh has a lot of nerve disparaging our President. Should I refer to him as "Florio's Puppet"? As for the voters in Paterson, look what pieces of crap they vote in election after election, so to disparage Trump by calling him "The Orange One" how would the Mayor like it if people called him "The Arabic Muslim One"? One of his donors put up this garbage so you can be sure there will be no repercussions. At least Trump is making the economy boom so the welfare checks will keep rolling in off of the taxes of the people who work for a living.